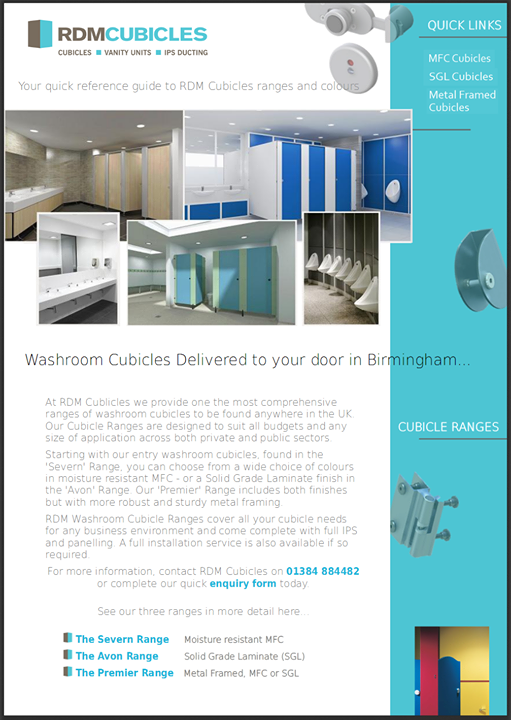 RDM Cubicles are consistently proven to offer only the best quality Washroom Cubicle Solutions to customers located in and around the Redditch area. 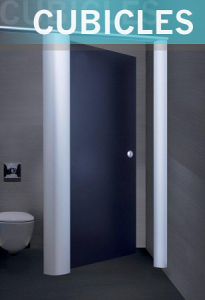 With our comprehensive range of Cubicles, IPS Ducting and Vanity Units, RDM Cubicles can fulfill a wide range of bespoke cubicle system specifications with solutions available for almost any type of installation. Whether Education, Leisure, Retail or a commercial, office or industrial environment, we have the solutions you need. The Severn Range: MR & MFC cubicles. The Avon Range: SGL & Compact Grade Laminate cubicles. Our Premier Range and Education Range can be viewed by selecting ‘Ranges’ from the cubicles drop down menu at the top of this page. RDM Cubicles supply systems in a variety of colour options both in MFC and SGL Cubicles. We also supply a full range of hardware & ironmongery. With our West Midlands office based only 35 minutes from the centre of Redditch, your cubicles can be delivered almost immediately once in stock. Call for more details.